I’m so lucky to not have any food allergies or intolerances. Well, I can’t really tolerate peas… but that’s more just me being fussy than anything else (the teeeextuuuure, yuck). Luckily, nothing actually makes me sick. But unfortunately, food intolerances seem to be more common than ever, and I’m sure some of you guys aren’t great at digesting dairy (or you know someone who isn’t). If so, I have a really exciting product to tell you about today – a2 Milk™. Let me tell you a little bit of the science behind a2 Milk™. 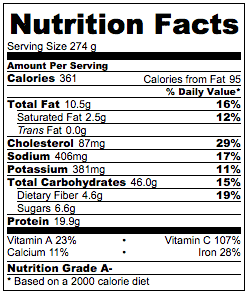 Milk contains two different kinds of protein – A1 and A2. It’s usually the A1 protein in milk that causes people problems, but apparently it was human domestication that triggered cows to start producing the A1 protein – some cows are still naturally A1-free. a2 Milk™ comes from cows who naturally produce only the A2 protein, meaning it’s much easier to digest. 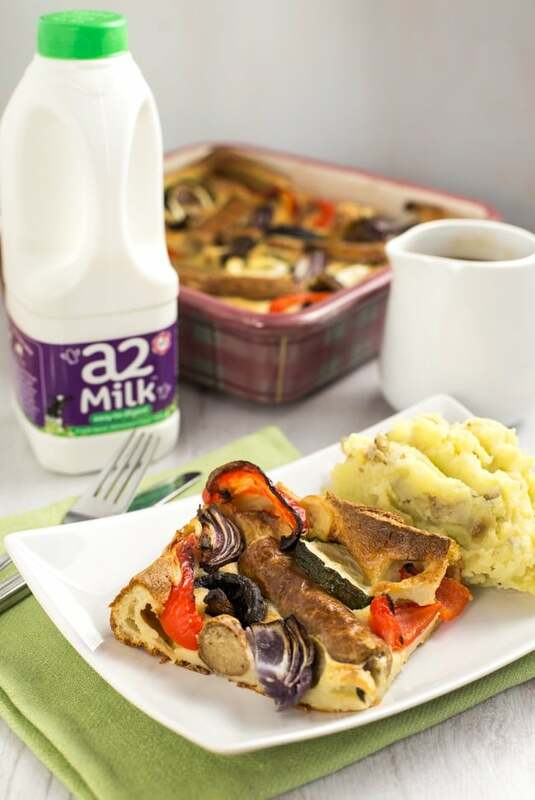 It’s fascinating stuff – you can find out more about the A1 and A2 proteins on the a2 Milk™ website. A recent study has even shown that switching to a2 Milk™ led to higher levels of a the antioxidant GSH (which has been linked with many health benefits), compared to drinking regular milk. I may have a science degree (Psychology), but it’s been a while, so I’ll let you read the study yourself if you’re interested in looking at it in more detail. Anyway, the point is: a2 Milk™ tastes just like regular milk, but it could be a game-changer for people who struggle with dairy. I would definitely give it a try if you’ve ever had any issues with milk! 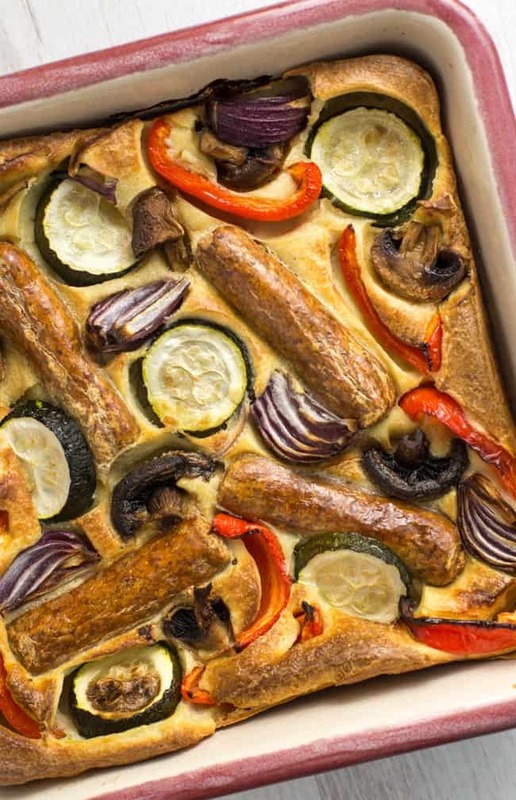 I used the milk to make a classic British toad in the hole – basically (vegetarian) sausages cooked in a giant Yorkshire pudding. I livened it up with some roasted veggies for extra colour and flavour. Served with mashed potato and lashings (and lashings…) of gravy, toad in the hole makes a pretty amazing dinner. Took me back to my childhood! First, prepare the Yorkshire pudding batter. Sift the flour into a large bowl, and add the eggs and a small amount of the milk. Whisk until smooth, then add the remaining milk a little at a time. You should end up with a thin pancake batter. Season with salt and pepper, and set aside. 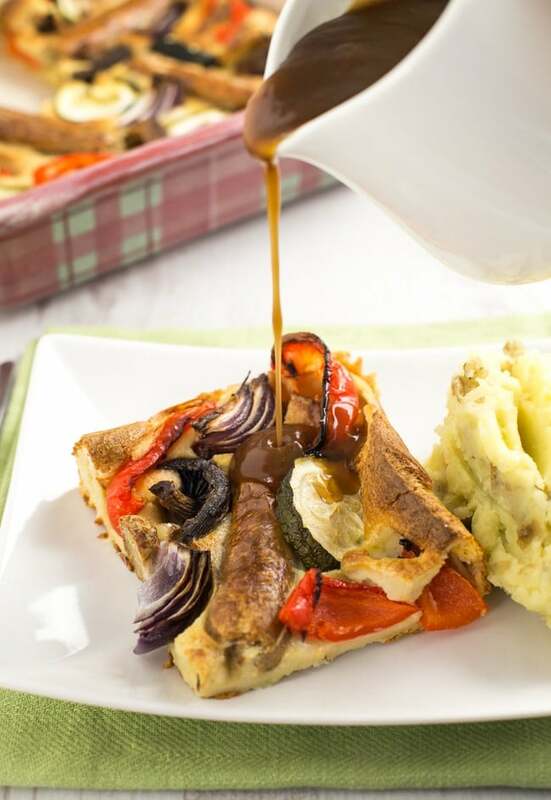 Drizzle the oil into a large baking dish (mine measured around 9 inches square), and add the vegetarian sausages. Bake them according to the instructions on the packet. They don't need to be fully cooked - it should be fine to cook them for around 2/3 of the recommended cooking time, as they will continue to cook later. I cooked mine for around 15 minutes. When the sausages are most of the way cooked and the oil is very hot, remove the sausages from the pan. 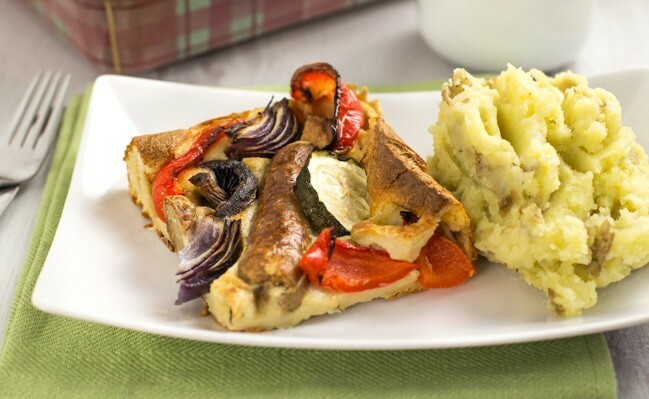 Pour the Yorkshire pudding batter into the dish, and top with the sausages and prepared vegetables. Return to the oven and cook for a further 45 minutes, or until the Yorkshire pudding is browned and well risen. Cut into quarters to serve. Love traditional British recipes? 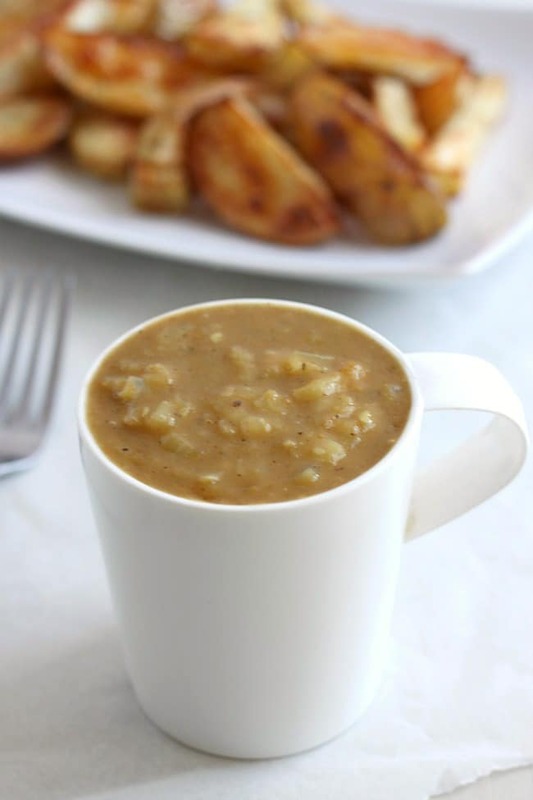 My homemade chip shop curry sauce is one of the most popular recipes on my site – the sort of thing you’d find in almost any chip shop in the UK! « Previous Post5 year blog birthday – Q+A video! Love this recipe – it looks delicious! Just wondering if anyone has tried to freeze it? Thanks in advance! I’ve not tried freezing this one I’m afraid. Worth a try! This was very good, and the veggies reduced the guilt of the pudding. However, for me, they also kept the pudding from rising very much. Next time, and I will definitely make this again, because I loved it, I will roast the vegetables separately from the rest. Thank you for a wonderful dinner! I made this today and it was really lovely. :) And practically no work at all. I forgot to spray my pan with extra grease before putting the batter in, though. Gosh, can that stuff stick! Shan’t make that mistake again, LOL! I find myself wishing I’d had some fresh herbs. I think rosemary would have worked well along with the veg, but I’m not sure if it would have worked with dried rosemary. Of course I didn’t think of this until now, but I’ll try to remember for next time. I love this recipe. I am not vegetarian but do try to eat less meat. I think I will make this recipe as you pack it out with lots of veggies. It is also a great recipe to make after work. Thanks for sharing! Now you’re talking! Comfort food of the highest order! As Helen says, lactose is a milk sugar that is found in all forms of animal milk (including human!) and most adults who are intolerant of dairy are lactose intolerant, so would only be able to drink the lactose free milks or nut/oat alternatives that are widely on sale. A lot of people who think they are intolerant may not be, as Helen says, so it’s worth getting formally diagnosed if you are concerned. Most children are cows milk protein intolerant, lactose intolerance is much less common in children because they have to be able to drink their own mother’s milk, however in adults, it’s generally the sugar, not the protein that causes the problem. A2 milk might therefore be appropriate for children but it isn’t going to help the rest of us. It would be worth you clarifying this, as someone who is actually lactose intolerant and takes your recommendation to drink A2 milk is going to make themselves very ill! Thanks for the info Liz :) I would certainly never suggest that someone who has trouble with dairy suddenly decides to drink a whole glass of a2 Milk without testing it first, but I do think it’s worth giving it a try for people who aren’t necessarily lactose intolerant, but just find themselves bloating or having trouble digesting milk. Absolutely! As somone who suffers with lactose intolerance, I have had many conversations with others who think they might be too, but as you say there are many people who find too much milk or certain types, e.g. full fat, worse than others but who don’t have specific symptoms suggesting they are intolerant to lactose. Anyone in particular who finds that cooked milk is fine (sauces, custards etc) might do well from this, as cooking denatures the protein but won’t affect the sugar! Great tip about the cooked milk, thanks! Mmmm what a lovely meat-free alternative! 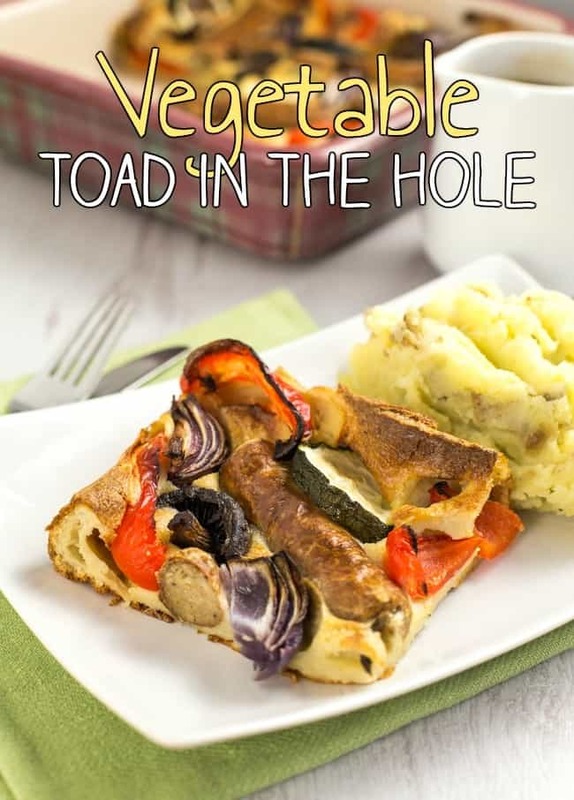 We’re big fans of toad in the hole in our house. I’ll have to try this recipe with the kids and see what they think! 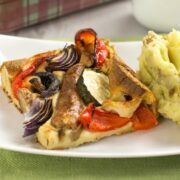 What a fab idea to put the veggies in the batter too. I’m quite tempted to do this and leave out the sausages! Just one small niggle (sorry) – you say that a2 milk might be better for people who are lactose intolerant, but lactose is milk sugar, not protein, so it probably won’t make any difference for those people. BUT, most people who THINK they’re lactose intolerant, are actually CMP (cows milk protein) intolerant, in which case this milk might help. Hi Helen, great point – I’ve edited the mention of lactose intolerance :) Thanks! Won’t the sausages be overdone and dry with an hour in the oven, though? Thanks Becca….l might just quickly brown them on the hob instead.